WeetHet - Audio - How to creat my own MP3's? Creating your own MP3's of your own Audio (Music) CD, used to be pretty difficult. One needed specific tools and an MP3 codec. First one needed a tool to copy an audio track to harddisk, a so called ripper, like Audio-Grabber, which still can be found at the Audio-Grabber homepage. Besides the ripper, one needed a tool and a codec to convert the track to MP3, this is usually the modified Frauenhof codec by Radium which you can still download here. Time has changed things a bit and tools for burning CD's often support the ripping of tracks as well. Tools like Nero, rip the track and convert it instantly to MP3 for you saving you a lot of work. On their website you can download a trial version. This guide is written specifically for Nero, explaining step-by-step what to do. Note: The screenshots used on this page are made on a Windows XP PC, using Nero version 5.5.6.9 Depending on the Windows version and Nero version, the images on your PC might be different! Note: Read the disclaimer first! Copying music CD's may be illegal! Insert a music CD in the CD-player of your PC. Select the proper CD player. Using the (Internet) CD-database and the unknown CD. Settings of the MP3 properties. Finding a place for your MP3's. To make your first start a bit easier, start with inserting a music CD in a CD-player of your PC. This can be the CD-writer, a regular CD-Rom player or a DVD-player. This way, your first "rip" (copying the audio tracks) will be easier since Nero instantly knows the CD. If you just downloaded the trial version of Nero, then you must install it first. Double click the file you just downloaded. The file is called "NEROabcd.EXE" where "abcd" indicates the version number of Nero. Warning for Windows XP users: Use version 5.5.5.1 or newer! Earlier versions do not work properly. After installation, we start Nero. Nero is to be found in the start menu at the item "Ahead Nero". Click the Windows "START" button, select "Programms", select "Ahead Nero" and finally click "Nero - Burning Rom". Nero will now start, in case you have a CD or DVD writer, Nero will show you that it found a device capable of writing either of them (in the lower right corner - see second screenshot below). Nero usually starts out with the Wizard (screenshot 1) or the "New Compilation" (screenshot 2) window. Close either windows by clicking the button "Cancel". Go to the menu "Recorder" and click the option "Save Track...". Here you see that my PC knwos 3 CD-players. The "V386 Stealth DVD" (a free and excellent virtual CD player, download at CD Daemon), a"Plextor CD-R PX-W1610A" (the CD-writer - you can recognize this beacuse of the "CD-R" text) and a "Hitachi DVD-ROM GD-5000" (my DVD player). Now click once on the CD-player you are about to use - this is the CD-player where you inserted the music CD, and click the "OK" button. Pretty quick, Nero is finished analysing the CD and will show the CD-Database window. Here you can create a databse of your own CD collection, or get the CD author, titles etc. from the Internet. Information of this CD can be retrieved of a so called CDDB - a very large CD-content database. This can save you a lot of time, typing the titles of songs etc. This data - if available for the CD you have - is being used for generating filenames for your MP3's in the format "band - title.mp3" instead of "Track01.mp3". So suppose you have the CD of "Anne Clark" and the song you are about to copy is called "Shades", your MP3 will be called "Anne Clark - Shades.mp3". Which can save you a lot of time later on when looking for that particular song in your MP3 collection. Caution: Nero will close this window automatically after a predefined time! So now you have to make a choice. Do I want to retrieve data from the Internet? If the answer is YES, then click the "Access Internet Database" button. Nero will contact the Internet to see if this is a known CD. If Nero does find your CD in the CDDB database on the Internet, it will show the found title(s) in the upperpart of the window. Now click the diserd title and next click the "Selected CD" button to use this data. If the answer is NO, click the "Cancel" button (or wait for Nero to close the window) and continue with Step 5. The unknown CD - OPTIONAL! THIS STEP IS ONLY RELEVANT IN CASE YOUR CD CANNOT BE FOUND ON THE INTERNET DATABASE! You now have the option to create your own database. Incase you have an original CD, you migh consider sharing the information on this CD with others by uploading the data to the Internet Database. Thousands have done this before you - which is why the database is available. Your contribution is also welcome. You don't have to, but it would be nice. Unfortunally, this requires some qork on your side - which is for most user too much work (unfortunally). Your E_Mail address: Your e-mail address. Now click the "Apply' button and the "OK" button. Go back to Step 3. Once you are back at Step 4, you will need to enter the CD data. Try to be acurate and enter as much data as possible. Typo's and titles like "Unknown" or "CD number 10 of Hans' collection" are not usefull to anyone. In this example I use the CD of the "Deaf Dog Blues Band" (Hi Ton! 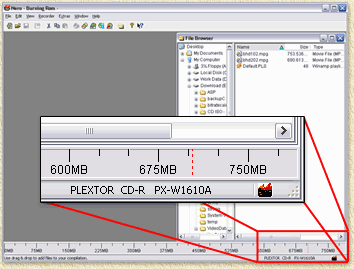 ), which is the CD I inserted into my CD-Romplayer, After clicking the "Selected CD" button, as described in Step 4, the following window will appear. In this window all songs of that particular CD are displayed and selected. Now you can selecteer the songs you would like to convert to an MP3, using the left mouse button (or click the "Select All" button if you want them all). When selecting 2 or more songs, keep the CTRL toets pressed while selecting your songs. Windows explorer works in a similar fashion. At the field "Output file format:" you can set the desired output format. By default it is set to "mp3PRO (*.mp3)". Although we are not going to be using the mp3PRO format, we still need to keep it on this setting to create regular (non-mp3PRO) MP3 files. Now click the button "Settings..." for detailed settings - the default settings are not good enough for us. Uncheck the "Enable mp3PRO" option. Although mp3PRO produces a better quality, due to compatibility issues with particular MP3 players, we do not wish to use this. Set "Encoding quality" to "Highest". It will take Nero a bit more time, but it is well worth the result. Check "Constant bitrate" en zet de waarde op "128 kBit, 44100 Hz, Stereo" (or higher). A variable bitrate produces a better compression ration (i.e. files get smaller with a similar quality). Downside is that not all MP3 players are able to handle variable bitrates. So if you're sure you playback device can handle it (for example your PC), then use it. If not, or in doubt, DON'T USE IT. Step 7: Where to store your MP3's? Now you're back in the "Save Track" window. Here you can define where to put the MP3's files. At the field "Path" you can enter the path where to store your MP3's by typing it. You can also (which is easier) click the "..." button and browse your PC for a location. The upper progressbar indicates the progress for the current sound-track, the lower progressbar indicates the total progress of the ripping and converting process. Depending on the speed of your PC, the amount of memory and the speed of the CD-player. To give you an indication: my PC (AMD Athlon 1300 Mhz, 1 Gb memory and a 40 speed CD player) takes up to app. 4 minutes to rip the "Deaf Dog Blues Band" CD (which is not a fullsize CD). Like I said before,... it's different for each PC. In the lower right corner, there is a button called "Drive". Click it and select the option "Eject". The CD is now being ejected. Wait a few seconds and click the "Drive" button again, now select the option "Refresh".